Junior Jack Filpi drumming out, surrounded by his other fellow percussionists (R. O'Sullivan). In sixth grade, junior Jack Filpi joined band to pursue his love of music; he started out on the tuba. That following February though, Filpi was concussed, and his doctor had recommended that he give up the tuba, which also meant giving up band, and that was something that Filpi did not want to even consider. Filpi’s band director allowed him to switch instruments so that he could still play with the band. Filpi switched over to percussion and immediately was in love with the drums. “I like playing drums because it’s the back bone of the music,” Filpi said. Now, a junior in high school, Filpi plays tenor drums every Friday night during the fall, with the rest of the marching band, and during every sixth period during school. 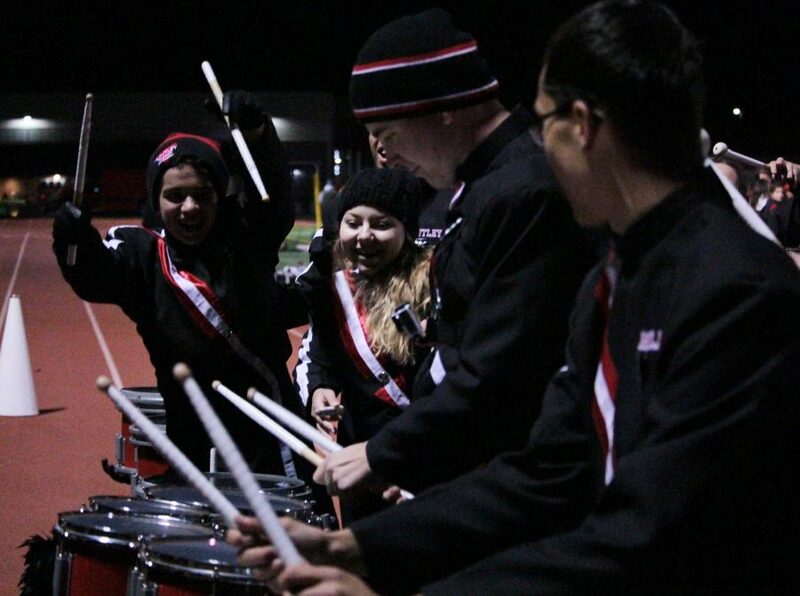 Filpi’s friend, and other drummer, junior Nick Chung, played a duet at one of the football games this past fall. The duet took about five total weeks of practice: two to learn it, and another three weeks after to really perfect it. “It was really bad at first but we eventually got it down and it was really exciting,” Filpi said. Performing the duet for the first time, in front of all of Raider Nation and the parents of Huntley High School, was nerve-wracking, to say the least, for Filpi and Chung. When the duet had ended, the applause started, and all of Filpi’s nerves went away. It’s moments like these that Filpi looks forward to most when playing with the band at football games and competitions. Filpi has already started practicing for next year’s season. He hopes to keep things new.